Our guide is perfect for older veterans who live in Wales, and their families and carers. 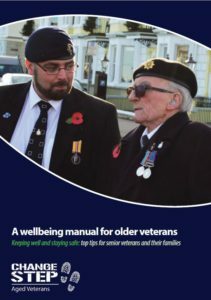 It will provide you with information about the most common issues that affect older veterans’ well-being, and some great sources of support. Perhaps you feel there isn’t anyone you can talk to, or you have concerns about a relative or someone you care for who is an older veteran? Our guide provides vital information about and links to organisations that can provide the support you need. Just click here to download our guide. If you would like a printed copy of the guide, please call Change Step on 0300 777 2259, or ask someone you know from a veterans support organisation. You can find out more about Change Step, and our project dedicated to the needs of older veterans, by clicking here. Get in touch, or contact us through Facebook or Twitter, to let us know how this guide helped you!